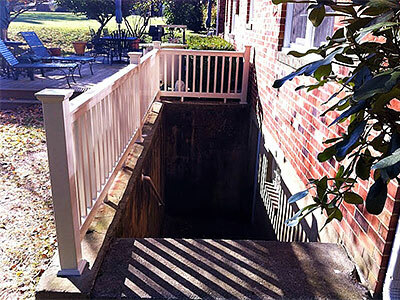 There are a number of elements that are added to the structure of a deck to make it complete and deck railings are very basic additions to most decks that we install in Annapolis. They add a very finished look to the deck and we generally add them to the designs that we provide you. If you already have a deck and need railings added, we can do that for you as well. They lift the look of on old deck and a lot of character to it. 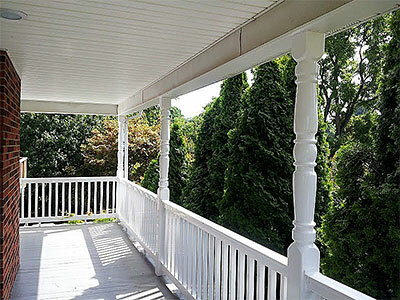 Standard Deck Railings - These are the railings that are typically added by home builders and are very cost-effective. If you have a modest budget and want value for money, we can install these standard deck railings for you. These are generally made of pine or poplar and as long as you finish and maintain them well, can last for as long as ten years. Custom Wood Railings - These are very stylized and specialized railings and have a very ornate look. We can customize these to your liking and style and also assure that they will blend in perfectly with the look of the deck, house and the landscaping. These custom deck railings also need specialized installation techniques and can be a little more expensive than the standard pieces. We also use hardwoods such as mahogany or cedar in crafting these and they lend a very elegant look to your home. Metal Railings - Metal bars affixed to the wooden frame and this kind of deck railing is very sturdy & durable. Apart from welded metals and wrought iron, coated aluminum railings are also becoming very popular. They are lightweight, available in a range of colors and designs and are cost-effective too. Composite Railings - Composite material is a relatively new introduction in the market and when we customize installation of a composite deck, we can also stylize the deck railings accordingly. The designs can be either contemporary or colonial as per your liking and budget. These are b, durable and available in a number of colors too. Special Materials - Tempered glass, Plexiglas and cable decking railings are a great way of enhancing the look of the deck without sacrificing the view. The cost of the material and installation is higher than that of wood and composite. Fence & Deck Connection prioritizes quality and efficient service and we also provide you with the most cost-effective decking railings in Annapolis. You can reach us at 8057 Veterans Hwy Annapolis, MD 21108.